Quick note: During the summer, we'll only be publishing one blog post per month as we focus on some new activities and allow you some down time without falling behind on content. Call it Corporate Social Responsibility (CSR), cause marketing, philanthropy, a social impact program, corporate citizenship, or simply giving back—doing good is good for business. From entrepreneurs to corporate giants, it's becoming more clear than ever that giving back is the new black. Sure, it's a fine idea to say that incorporating philanthropy and giving strategies into your business is a positive decision. And for decades, many business leaders only thought that cause marketing was a nice PR strategy without a lot of substantive results. But times are a changin', my friend! In fact, I'll give you five reasons why this kind of goodwill is actually a shrewd business move. I get it: The first rule of business is that you have to make money. No surprise there. But what If I told you that you could indeed make money and have a positive impact? Interested? According to a 2017 study by Cone Communications, nearly nine-in-10 (88%) Americans say they would buy products from a company leading with purpose. ^^^ I suggest you reread that fact. Go ahead; I'll wait. Wow—that is an enormous benefit to your bottom line! You want to increase sales? This is one surefire way to do it. Just think about your own behaviors. I realize that this subject is right up my alley, and may seem like a no-brainer for someone like me. But I have plenty of friends and family members who aren't in this space. To demonstrate, let's look at an example. I've sold plenty of Warby Parker glasses in my day—and I've never worked for the company. However, people around me have casually mentioned that they're in search of a new pair of glasses. I then ask them if they've heard of WP, and many times, the answer is no. I tell them that WP has an awesome one-for-one model where they donate a pair of glasses to someone in need with every pair sold. And their prices are extremely competitive with many retail brands. Now my friend has a choice to make: They can go to any retail outlet and pick a pair of glasses off the shelf, or they can purchase from Warby Parker. For many people (about 88% as we noted), it's an easy choice to grab a stylish pair of WP's that will benefit them and someone else. And that's how it works. It's that easy. Most of us want to believe that we have purchase power. We want to believe that our decisions do make a difference. And, guess what, they do. Now, let's take into account another aspect of that example: word-of-mouth marketing. <-- This is the one marketing tactic to rule them all. It's better than any form of advertising. It's also the hardest to manufacture. That same study by Cone Communications also said that 78% of those surveyed with tell others about companies with a social impact program. Think about it: we all love to share both our positive and negative purchasing decisions. And it's incredibly persuasive. Just consider those Yelp and Amazon reviews you diligently read. Finally, by partnering with a cause-focused organization, you automatically increase your reach, and in turn, increase sales. That nonprofit or social enterprise will be thrilled to work with you, and probably more than happy to share about the relationship with their own tribe whether there is a direct cost benefit or not. If you've gone through the hiring process for your company, you know that it takes time, effort, and money. And if you've gone through that process repeatedly, you know that it often takes more money to hire and train a new person than it does to retain an employee. This is another jam that being a good corporate citizen can get you out of. An emphasis on inclusion and diversity in the workplace." And, in case you were wondering, according to the US Census, there are 83.1 million Millennials, accounting for one quarter of the country's population, and 61 million Gen Zers. That's a lot of potential employees! But the important thing to remember here is that, no matter what generation we each fall into, everyone is searching for significance and meaning. And because we spend so much of our lives working, we want those hours to count. You may be in a great position to make that happen. We've hit on this a little bit already, but I don't want to skim over the fact that having a Corporate Social Responsibility (CSR) element can help your brand achieve recognition and stand out. People may either remember your name better, or it may give them some aspect of your brand to search for. You become more memorable, and you'll automatically be associated with a positive image. Speaking of, and I hope this doesn't happen to you, but there are times when crisis may strike. Your product or service may harm someone, you may make a bad financial decision, or your leadership may fail you. In these instances, one of two things could happen: either your reputation does not recover, or it just takes a hit. In that same survey above from Cone Communications, they found that 67% of people would be more willing to forgive a purpose-driven company if that company makes a misstep versus a traditional company. Even though I'm an introvert, I love growing my network. I think the more people I know doing good things, the better. I talk to people all the time that probably won't ever become clients, but I'm grateful to know they exist because it may serve a different purpose down the line. And there are so many more examples! Heck, it's been a very long time since I worked at hospitality public relations firm, but friends still come to me looking for restaurant recommendations. This happens all the times in our lives, and more so when you're an entrepreneur or small business. We tend to keep our heads down and plow through the day, sometimes only coming up for air when a need arises. In that instance, it's good to know the people who can help you find an immediate solution to your problem or question. According to Nonprofits Source, 72% of all giving in 2017 came from individuals ($281 billion). So, if you're reading this, it's highly likely you donated to charity. And that's probably why you're interested in this subject in first place. You want to be more generous. Corporate giving is just another way to express your personal and business values. And whether you're selling plumbing supplies, photography sessions, homemade cupcakes (Can we be friends? ), or software, people want to know there is a living, breathing person behind that logo. Humanizing your brand is your greatest marketing tactic, not that I just want you to think about it that way. I know as a business owner (and human) there are things that make you happy and sad. And I'd love to know what that is. Your customers and would-be customers feel the same way. But supporting your local economy also means bettering the lives of those around you. And when you help people live better lives, make more money, and increase their own profit margins, they'll be in a better position to purchase from you as well. It's the circle of (business) life. if you're just looking at the bottom line, then we can't ignore the fact that charitable giving offers a tax break. You actually get credit from the government for doing good. Yep, Uncle Sam tips his hat to you. But I firmly believe that even if this is the primary reason you begin giving back, it won't stay that way for long. Generosity is infectious, and once you begin working with a cause and contributing toward solving an issue, you'll learn just what the Grinch did—your heart will only continue to grow. Before we leave this section, I also want to make a quick note. If getting a tax break isn't important to you at this stage of business, or you have the ability to work with more than one organization, I suggest taking a look at social enterprises. It's true that some nonprofits are social enterprises, but in my opinion, not all of them are. Many social enterprises are for-profit entities that are directly tied to a cause. I already gave you the example of Warby Parker above, but there are also companies like LSTN, TOMS, Sevenly, Gifts For Good, To The Market, and literally thousands of others. And as an emerging business model, there are lots more small businesses like them who could use a volunteer, partner, or sponsor like you. For example, my friends here in Atlanta at Dr. Bombay's Underwater Tea Party and Dwell are both very small operations tackling very big issues. They would be delighted to hear from solopreneurs and small businesses looking to play in the social innovation space. If you've read this far, you likely fall into one of two camps. The first one is that you are a believer, and just needed the right push to get you started. If this is you, go forth and do good! The second is that you agree with everything that I've said, but you're stuck at the HOW. Sure, it's great for large companies to incorporate philanthropy and giving strategies, but you're a solopreneur or small business. What can you do? Will you just have to wait until you "make it"? The grass is always greener, right? It seems much easier if you're making millions of dollars or have hundreds of employees. However, that isn't always true. As a small business, you're more flexible and adaptable. And you're already in a great position for creativity and innovation. The really good news is that already have enough to give, and you can get started now. 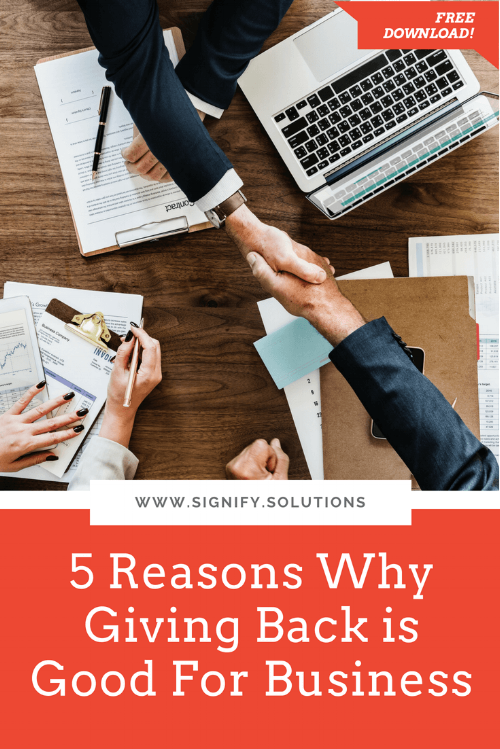 From volunteering to donating services and products (also called in-kind giving), there are literally hundreds of opportunities for you to give back without breaking the bank. In fact, it may not require any money at all. If you're a solopreneur or small business, my best suggestion to begin incorporating philanthropy and giving strategies is to start small. Begin with one relationship and one act. Make a list of what you have to give, what causes and issues you support, and then find someone working in that space. I recommend that small businesses work with small nonprofits or social enterprises. You'll find a lot of common ground, and also be able to see your impact more easily. If you don't have an existing relationship with a nonprofit you'd like to work with, attend one of their events, jump on their email list, or take one of the staffers out for coffee. You'll quickly determine if this will be a great fit for both of you. After that, take baby steps. You (and the organization) may be super exited to get this relationship started, but take the time to date before getting married. Neither of you wants to get in over your heads and leave promises unfulfilled. That will only make it harder for each of you to take this step a second time. Instead, test the waters, refine, and keep moving forward. You know . . . kinda like running a business. And if you need help getting your giving strategy off the ground, let me know. I love facilitating good! Already involved in giving back with your business? I'd love to hear about it in the comments! Looking for easy, low-cost ideas to incorporate philanthropy and giving strategies in your small business? Look no further. I want to be more generous!